Interesting tidbit found in the Boston newspaper the Repertory & General Advertiser of Tuesday, December 1, 1812. It appears that the article originated in another paper, the Alex. Gaz., which I'm assuming is the Alexandria Gazette of Alexandria, Virginia. A Challenge! 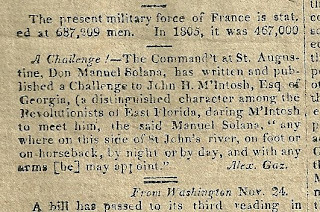 -- The Command't at St. Augustine, Don Manuel Solana, has written and published a Challenge to John H. M'Intosh, Esq., of Georgia, (a distinguished character among the Revolutionists of East Florida, daring M'Intosh to meet him, the said Manuel Solana: anywhere on this side of St. John's river, on foot or on horseback, by night or by day, and with any arms [he] may appoint." John H. McIntosh was the leader of a band of American frontiersmen that attacked St. Augustine in 1812 but was repelled by the superior forces. Don Manuel Solana was an equally fascinating character in early Florida history; I read online that his descendants still live in the St. Augustine area. 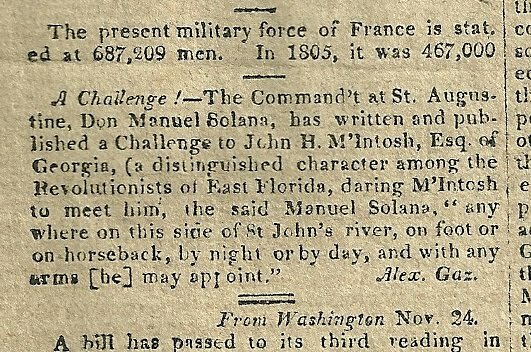 Assuming that this was the original Don Manuel Solana and not one of his sons or grandsons, the challenger would have been 72 at the time of the duel!